Okay, so it's not a photo from the magazine shoot, but it is from one of the stunning rooms in the cafe. I had seen the above photo long before the magazine shared the beautiful interior, as a friend of ours is behind this lovely room! I actually gasped when I saw his work within the pages of Style at Home... and then immediately sent a text to his wife. So today, what I want to share with you, is where this room started out, before our friend Craig of Knox Carpentry worked his magic on it! 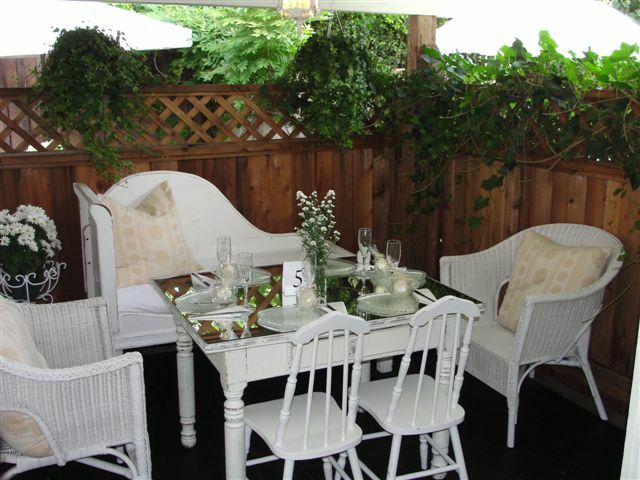 Originally, this quaint little dining room started out as a sweet little garden porch for guests to dine on. 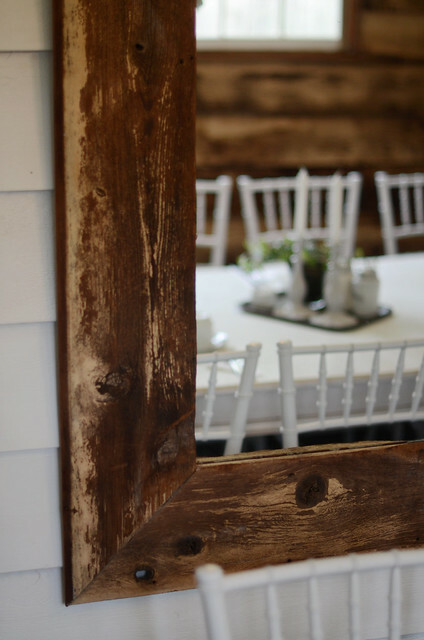 Craig framed in the whole porch and used old reclaimed barn board for the interior of the room. 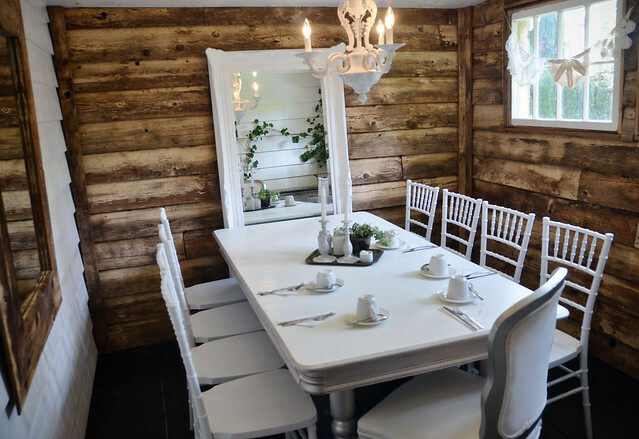 The rustic wood looks beautiful against the painted furniture in the space! 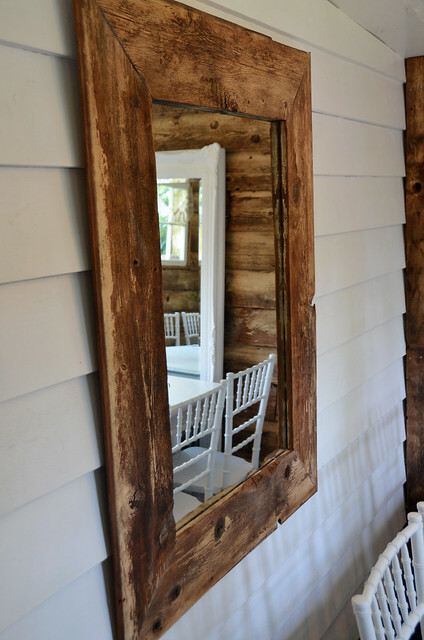 Also beautiful is the reclaimed wood mirror that Craig crafted himself. Craig has been working away on a few new mirrors to sell. At the moment, Knox Carpentry has one up for a giveaway over on their Facebook page! Why not head over, give them a like and show this family run business some love for the beautiful work they do? I count myself lucky to call such a talented Carpenter our friend! 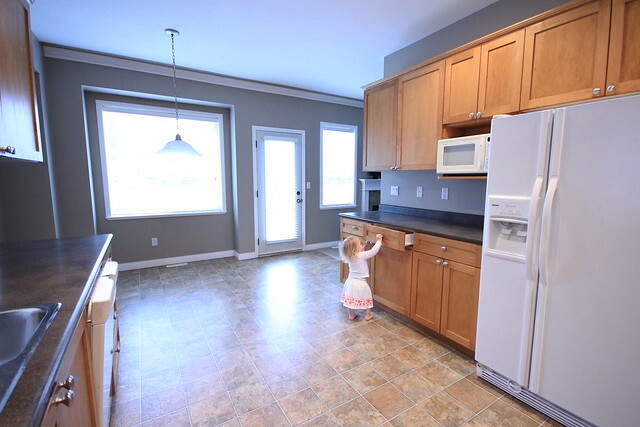 From the first time that we saw our house, we knew that the kitchen here was not exactly our style, but it sure had a lot of potential in there. 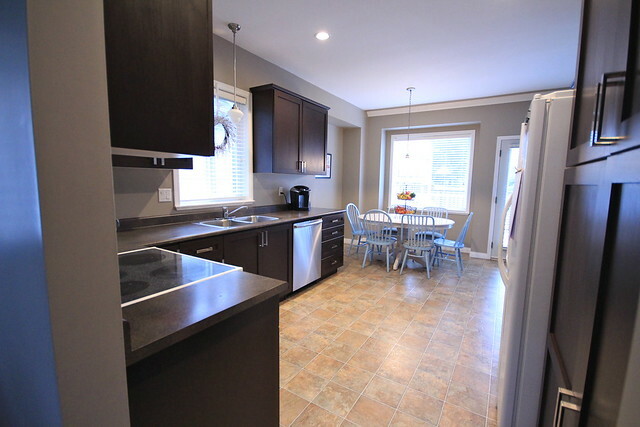 One of my biggest issues was the colour of those cabinets. It wasn't awful by any means, just not what we wanted. 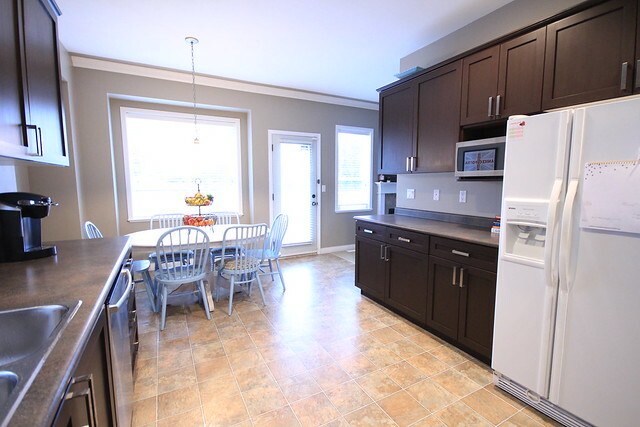 So, when the people over the The Home Depot got in touch and asked if we would be interested in renovating our kitchen quickly and on our own, we jumped right on board! A few weeks later this big bin of fun arrived on our front door step, with everything we would need to take our kitchen to the next level. It took us a little longer than anticipated to get started due to both B and I getting sick, but by the time Black Friday hit (yup, it was that long ago that this started) I was ready to get moving! (Just as a foot note, we had to break the rules a little. Our kitchen is quite large and the weather was a little cool, so we had to do half of our kitchen first and then jump to the other half afterwards). 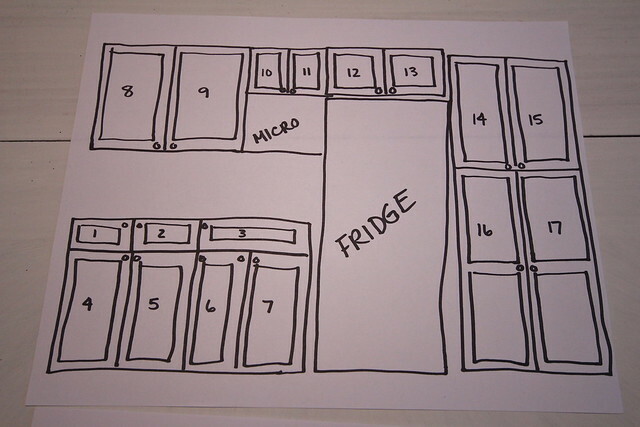 I began by sketching out the cabinets we were removing and numbering them all. 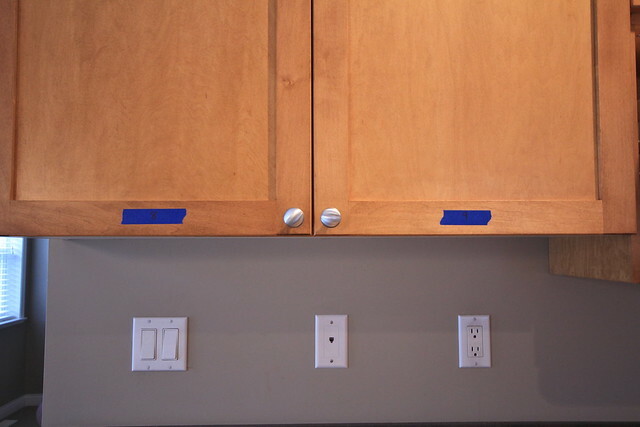 I then used some blue painters tape to put the coordinating numbers of each of our cupboard doors. This part ended up being a little silly. We ended up losing the tape while working on the doors since the tape had to come off and things got a little mixed up. Good thing all of the doors are different sizes, so matching them back to their proper spots was not an issue at all for us! 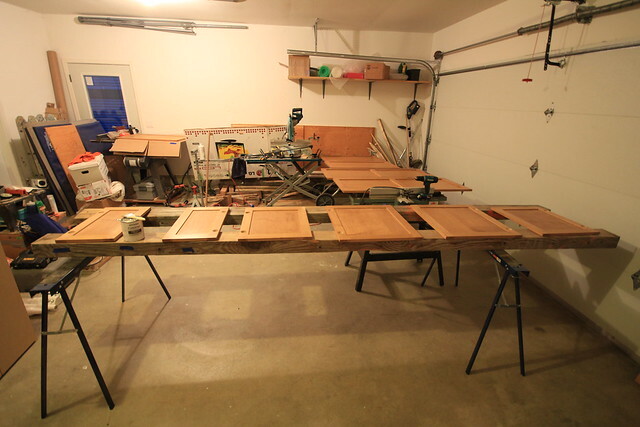 Next, B removed all of the doors and I wiped them all down with a green multi-purpose cleaner before bringing them out to the garage for the de-glossing phase. B helped with this. I did the de-glossing and he followed along behind me to wipe off all of the de-glosser. It was a little slow going, but much quicker having two sets of hands (as I would later learn). It was really important here to have lint-free cloths, so I highly recommend you make sure you have those on hand for this project. 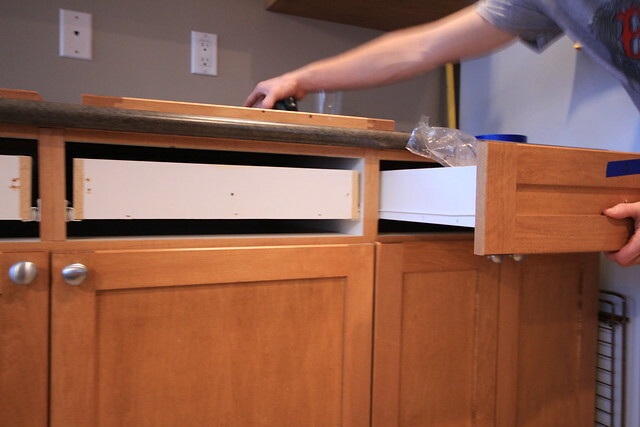 Before we de-glossed, B also filled any holes (mostly on the drawers where the new pulls would fit completely different), and drilled all of the holes for our new hardware. 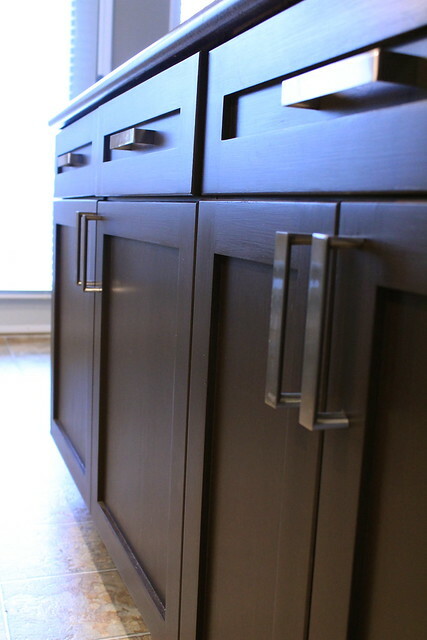 We decided to change them all since the knobs were far too small for many of our oversized cabinet doors. 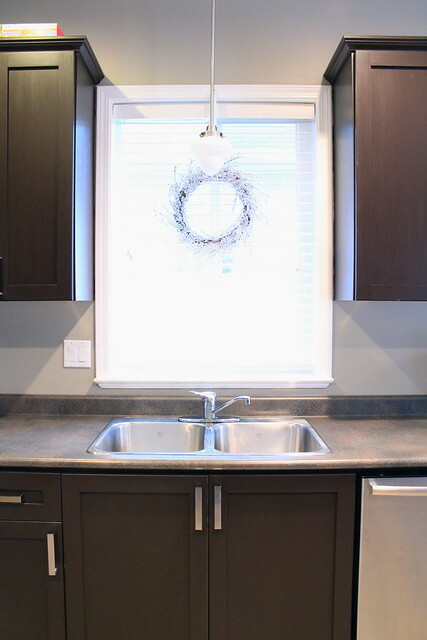 They just weren't balanced, and the new chrome pulls we have really help to update the look of the kitchen. So, with all of our cabinets spread out in the garage, new holes drilled and de-glossed, I got to work on the tinted bond coat (don't mind our garage mess). One important thing I learned during the process was to make sure you invest in some really good quality synthetic brushes. The one's we had kept loosing bristles into this coat, so I spent a lot of time trying to carefully lift them out. Sadly, a few got stuck and are still on our doors, but aren't that visible with the darker colour. Getting the tinted bond coat was quite a tedious process. 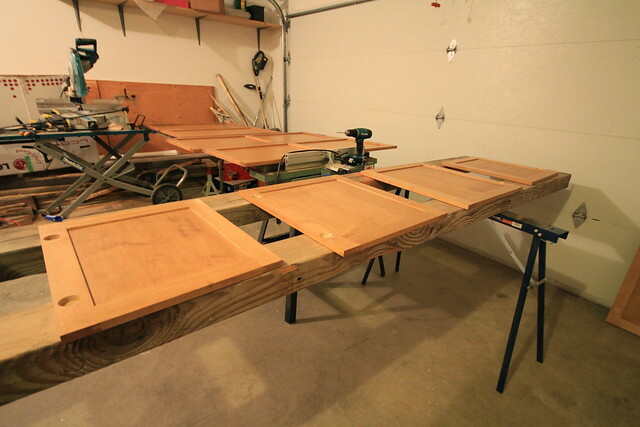 Each door needs two coats front and back, and you can't forget the edges of the doors either. 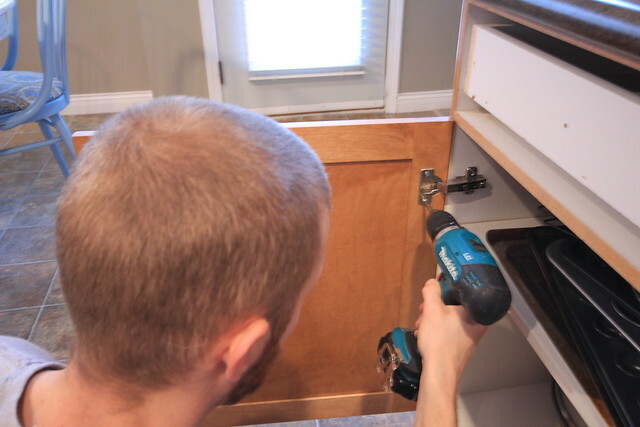 I had a hard time getting around the small edge of our recessed panel doors, so even after two coats I still had to go back and do some touch-ups before the next step. Honestly, this part would have gone a lot faster if I had an extra set of hands, but it was always me going solo since B needed to watch Halle. It also meant not accomplishing much during the days while B was off at work. This meant the project stretched on much longer than it would normally take if two people were able to give their full attention to it! Once all of the doors had two coats on each side, we approached the decorative glaze step. At first, B and I were convinced we needed to do this in order to get a more professional look. So, when I headed out to the garage to attempt this coat I started by putting a bit of the glaze on the back of one of the drawers and seeing how it turned out. Just as the instructions stated, it was subtle... VERY subtle. Actually, so subtle that neither B or I could see a huge difference on our dark cupboard doors. With the amount of time required for this step and the subtle change, we opted to skip the decorative glaze and move right onto the protective top coat. The doors and cupboards only required one application of the top coat which was nice, but at this stage of the game it's the drying process that takes the most time. You need two hours for each coat to properly dry, but they recommend waiting 72 hours before using your cupboards regularly! The waiting game was long but by the end we had a good rhythm and I was lucky to have B taping off the cupboards since he was a lot more precise than I would be. It all took longer than we anticipated (again, because I did the majority of it on my own during the Christmas season), but it was very much worth all of the extra effort! 1. Measure! PLEASE Measure! We had one kit to start and after B took all of the measurements (as per the kit instructions), it said we would need two kits. This is important because you need to mix all of your tinted base coat together to ensure a consistent colour on all of your cabinets! We're glad we got the second kit because although we didn't use a lot from it, we did need it! We also have some leftover now that we can use when we put in a seating bench in our dining nook! 2. Make sure you have two people who can devout their full attention to this project! If you can do that and give yourself a few days to do EVERYTHING at once (not broken up like we did), you can have this project done really quickly! 3. Invest in GOOD brushes and make sure you have lint free cloths! These will ensure that your cabinets look their best! 4. Be very careful when applying the topcoat. Make sure you aren't stingy when applying the top coat to the door fronts, but also be careful on the edges of your doors. I missed a few spots where the top coat dripped and collected and we had some bubbled edges we needed to sand down and touch up! Not pretty and very annoying. 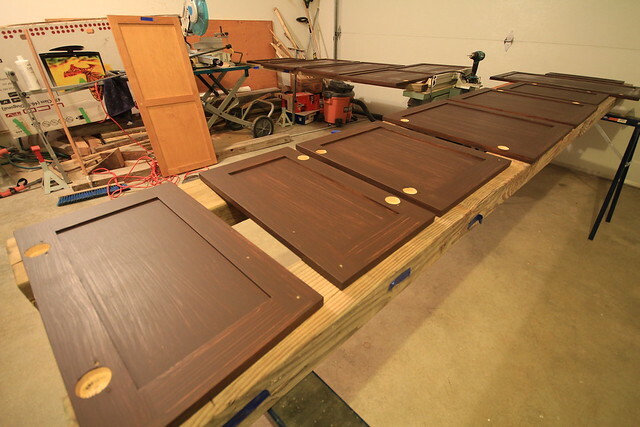 To go along with that, I found it worked best when I applied the top coat to the backs of the doors first and once those dried, I did the front of the doors and edges of the doors at the same time! At least if it dripped a little, it wasn't on the front (and most visible) part of the doors! 5. BE PATIENT! The project can feel tedious at times, doing the same thing over and over, but it's well worth it in the end. 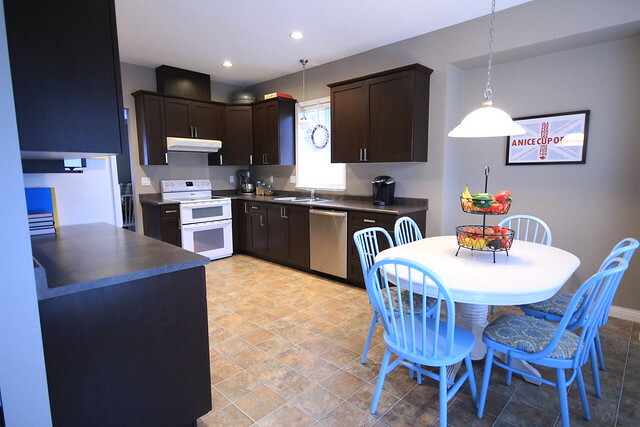 Yup, it took us much longer than we expected BUT the best part was we never lost of the use of our kitchen! Yeah, the doors were off for a while leaving us with our "behind the cupboard door mess" visible to all of our house guests, but it could've been much worse! We never had to pack anything into boxes or not have use of the sink or stove! We could still cook at home and wash our dishes no problem! We could not thank the kind folks over at The Home Depot enough for giving us the chance to try this kit out - and we hope our experience encourages you to try it out as well! It was nice that this update cost us nothing (thanks to The Home Depot, and a friend who gifted us those nice new pulls), but even if we had paid for the kits and supplies ourselves, it wouldn't have cost us much more than $350! 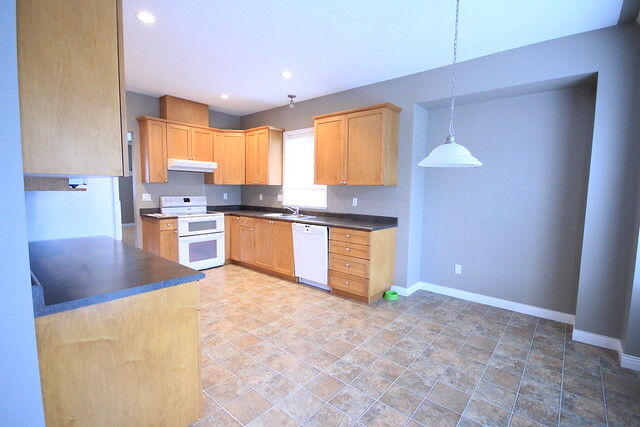 Have you been making any big changes in your home? 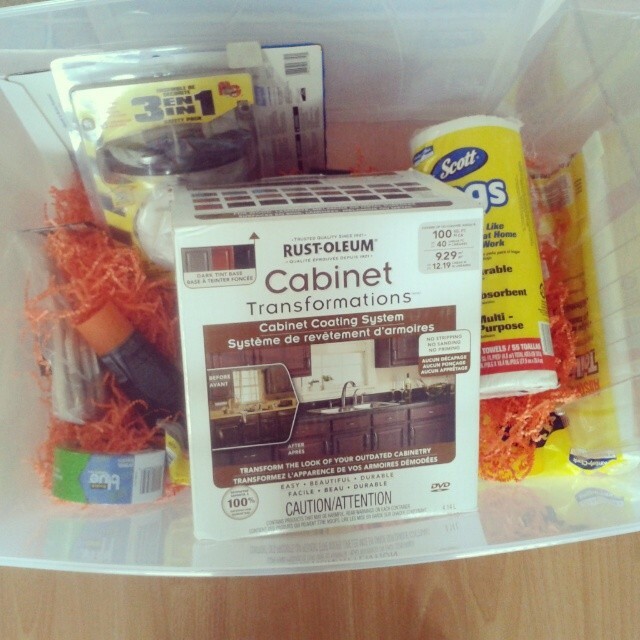 Anyone else thinking of trying out the Rust-Oleum Cabinet Transformation Kit? Details: Top of our list is a railing for our front porch. 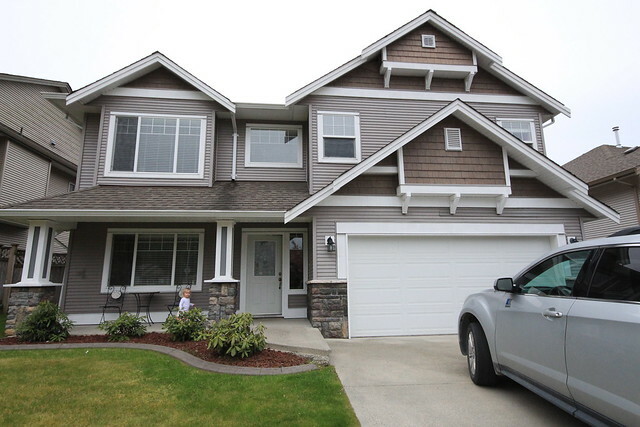 We'd like to build our own that looks like this, between the two posts on the front porch, and along the side. Landscaping: We definitely need to work on the existing garden, but we'd like to add more to the front lawn as well... we just need to come up with a solid plan before Spring arrives! Lighting: After removing the tiny, builder basic chandelier that hung in this room ages ago, I've spent a lot of time drooling over beautiful light fixtures for the dining room. (My top pick is this beauty from Restoration Hardware). Since my top pick is well over our tiny budget, we've opted to go the DIY route. We've already started to purchase materials, it's just going to come down to finding the time to assemble it all! Hopefully it will be sooner rather than later that we get the chance to shine some light in this space! Storage: That niche that currently houses our too small IKEA bookcase needs to be addressed! Our plan is to fill it with some beautiful built ins. I'm thinking of something like this, but with some cupboards (rather than drawers) on the bottom. Paint: The grey is actually quite nice (they picked the right shade), but it's becoming a bit overwhelming in a climate that is generally very grey! I'd like to lighten it up, but it's a matter of finding the perfect colour (I'm thinking cream or pearl), and then finding the time to tackle it. It's going to be a big undertaking and will mean painting a few rooms as the dining room is open to our living space and front entry way. Artwork: It is quite obvious that we have a huge empty wall glaring at us! I've gone back and forth on how I'd like to fill the wall with artwork. I think I've finally come to a conclusion and would like to put a number of enlarged personal photos from our travels in this space. I just need to decide what I want to use for frames. I have a few ideas. Bedding: We've been struggling with sheets that do not properly fit our mattress since we first bought it in the spring of 2012. 2014 will be the year to FINALLY correct this! Paint: I'm thinking a rich deep blue. I think it will really cozy up the room for us! Storage: Since this photo was taken we've brought two nightstands into the room, but we need to do more! Our tall, narrow IKEA dresser is not really cutting it. We could use the extra storage space, and a longer dresser will fill the wall at the foot of our bed much better. I'm really liking the Emmerson 6 Drawer Dresser from West Elm or the Hendrix Extra-Wide Dresser from Pottery Barn. 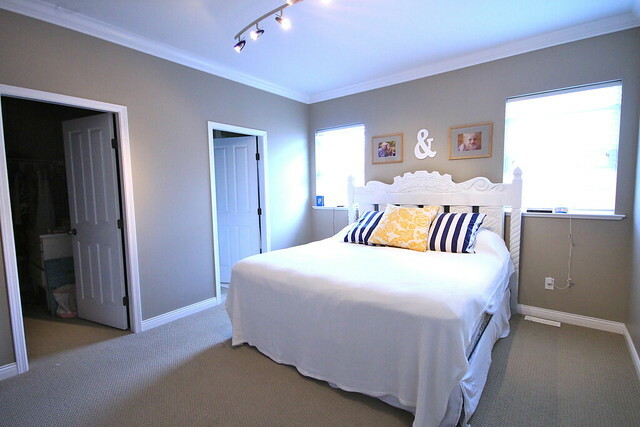 Lighting: It's funny that when we first bought our home we said that the light fixture in our master bedroom would be the first thing we would address. Here we are, almost 8 months after we got the keys and the old fixture still hangs in our room! Maybe this year it will finally get the boot for something more our style. Toy Storage: At the moment Halle has a lot of toys in the living room and basement, but I think more should be kept in here to play with. The only storage we have in there at the moment is her dresser and bookshelves. I plan to build some crate style boxes that we can stack up for books that she loves the most and some of her soft toys as well! Big Girl Bed: We had a double bed in her room at the rental, but it takes up far too much room in this space. After some searching and discussing, B and I have agreed to tackle building her a bed this year... maybe in the spring/summer? Curtains: We've got the curtains hung, but they are too short. I am still searching for the best fabric, and think I have found a winner - now it's just a matter of ordering it and adding it to the bottom of her curtains! Lighting: I'm not a big fan of the, uh, FAN in Halle's room but it does serve it's purpose in the summer months. Just like many homes on the West Coast, this place is void of central air conditioning. However, since it really doesn't get all that hot here and the evenings cool off nicely, I'd say her ceiling fan is not entirely necessary and we could get away with replacing it with something much prettier and buy her a fan that could sit atop her dresser or a future nightstand! We'll see how this all goes. This is more of a "nice to change" item. Storage: Since we've redone the cabinets (updated photos to come this week! 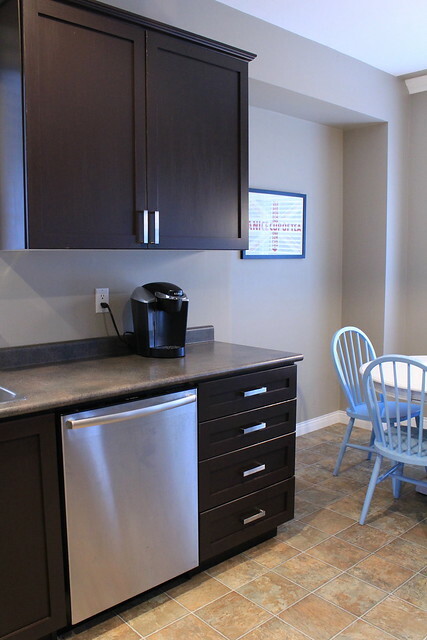 ), we've also discussed adding a seating bench in the window nook, using cabinets. We plan on looking at both Home Depot and ReStore to see what we can find. 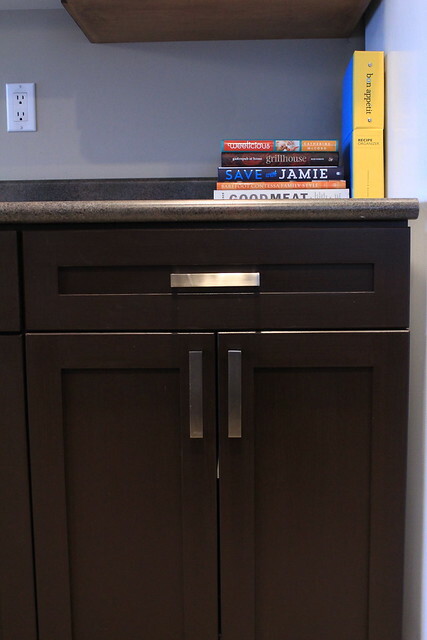 This will not only add some cozy seating, but also an opportunity for some extra storage in the kitchen (and we can make whatever cabinets we find match using leftovers from our Rustoleum Cabinet Transformation kit!). 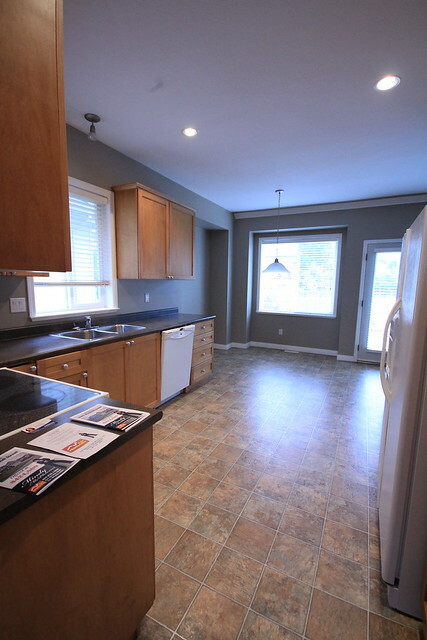 Lighting: We've already replaced the light fixture over the sink, and are planning a new light for the dining room, so we'd also like to address this light over our kitchen table. It's not bad, just not really us! 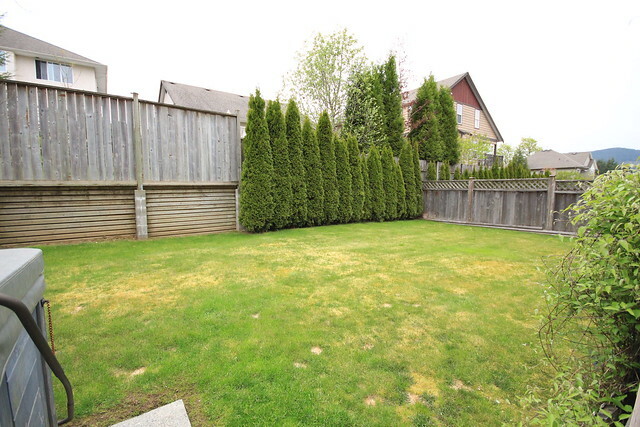 Gardens: Just like out front, we need to address the landscaping in the backyard. Right now it's pretty bland, and we've had some issues with the dogs digging holes. This year we'd like to make some changes and hopefully even include some raised garden beds where we can grow some of our own vegetables. 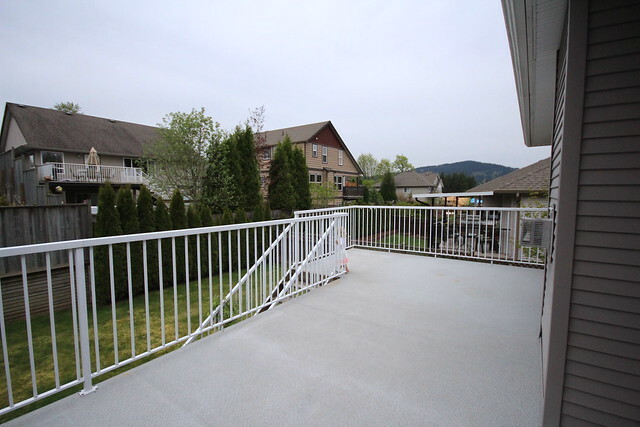 Seating: Our back deck is pretty huge, and a great spot for entertaining. 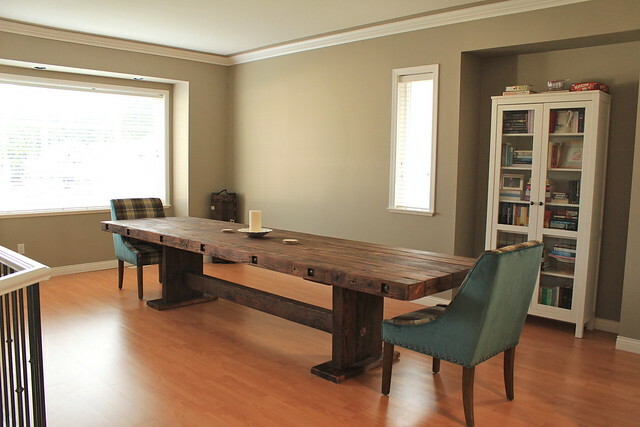 Last year we managed to purchase a pretty nice dining set off craigslist (from a family whose home we viewed and I fell in love with... but it didn't tick enough boxes off of our must have list), but there is plenty more room to fill. Last year we talked about building an outdoor sofa using old pallets to put at the far end of the deck (pictured above). Maybe this summer will be the year for us? I know this seems like a pretty long and ambitious list (I'm good for those), but nothing on this list really NEEDS to happen this year - most are just, nice to haves and we'll see how well we do! 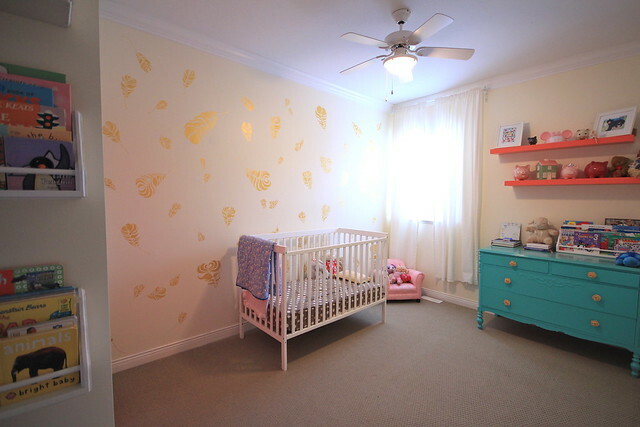 We'd like to make our house a home, but we also want to focus a lot of time on our family and enjoy Halle's littleness! Do you have a list you plan to tackle for the new year? What big projects are you hoping to start and/or finish in 2014? I've never really been one for resolutions. I just never found that I really met them, like many others and found them to be a "waste" if you will. However, over the last month I've done a lot of reflecting on the past year and thinking about how I want the next year to go. As great as 2013 was, I found myself stressed a lot of the time. Always worried about the next step and what I needed to do to get there. I found I really didn't spend as much time as I should living in the moment. 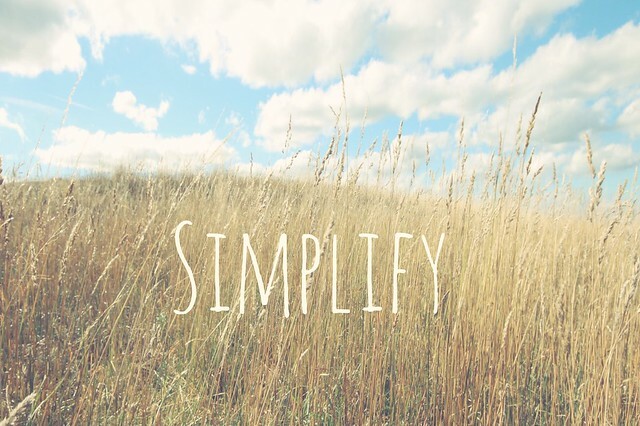 So the word I want to focus on for 2014 is "Simplify"
I really want to simplify in every aspect. At Home - On top of my own decluttering and organizing that I've been slugging away at since we moved, I've signed up for Apartment Therapy's January Cure. I'm hoping I can really take this month to go through our home room by room and donate or sell all of the things that we no longer use or need. If it's something we may need in the future, or use seasonally I'll be packing it away in a place where it belongs. It's time to reduce the amount of stuff we have and only focus on the things that we need. SIMPLIFY! Family - Family is obviously #1 for me! As much as I enjoy decorating and making our home feel like ours, I need to find the perfect balance with everything. I need to take more time out of every day to play and be with Halle. As much as I want her to use her imagination and learn independent play, I could also play more and read more to her. I also want to take more time for us to get out and do family things together. Exercise - I haven't done enough of this recently, and in this gorgeous place we live I don't know why I've been avoiding it. Not only have a friend and I been discussing getting in shape to run a 5k, I also hope to get out and do more exploring and hiking with B and Halle. We didn't do a whole lot after we moved, so this will be the year we do it! It's time for us to spend more time outside! Diet - By diet, I don't mean go on a diet. I mean the general food we are eating! I hope to make simpler, healthier meals that we will all enjoy. Cut out a lot of the junk we sometimes eat, and try to make life easier in many ways. A healthier happier diet, and meals that aren't as heavy and time consuming to make! Cutting down on the time it takes to make food, means more time to spend with Halle! Spending Habits - I guess this has a lot to do with other items listed above. This year we need to spend less money on things we "want" and focus on the things we really "need"! We need to do a better job of not just picking up "this and that" while we are out shopping. I want to get back to meal planning so we only buy the healthy groceries and snacks that we need, which will cut down on the grocery bill as well. It's time for us to start spending wisely and saving more! What do you want to focus on in the New Year? Are you making resolutions, or do you have your own motto that you want to follow?